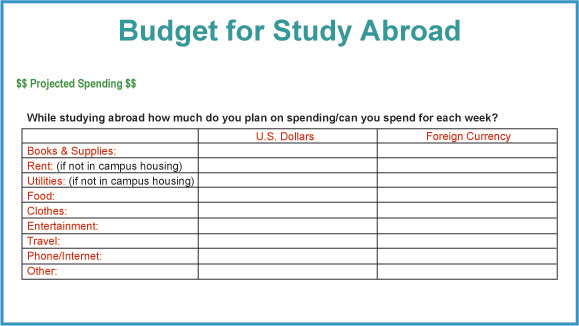 In this section, you will learn how to help cover the costs of study abroad in the country of your choice. With appropriate planning, most students that can afford to study at a U.S. college or university, can afford to study abroad in the country of your choice. It is important to take into account all program costs to ensure you have sufficient funds for a healthy and safe experience in the country of your choice. Loans and Financial Aid: If you receive financial aid, study abroad in the country of your choice may be partially or fully covered by the terms of your financial aid package. If the study abroad program you have chosen is directly associated with your U.S. home campus, you may have a better chance of having your financial aid money cover your program costs in the country of your choice. However, you can't assume that financial aid will apply; even if it does, there may be limits as to what it covers. Inquire about the terms of your financial aid package at your college or university's financial aid office. You may also be eligible for a student loan, or an additional loan, if you receive federal work–study as part of your financial aid packet. Before asking for a bank loan, ask a financial aid adviser on your campus. Scholarships, Fellowships and Grants: With advance planning, you may be able to obtain scholarship or grant money from your U.S. home university or even from the institution in the country of your choice where you will study. There are many academic awards and fellowships available for students with an interest in study abroad or other international experiences. To find scholarship and fellowship opportunities, visit your college or university's financial aid office, search on–line, or consider purchasing one of the many books available on the subject. Many academic departments also offer student research grants for research completed abroad; most often, the fields of anthropology, geology, and medicine offer research grants. Other Sources of Money: Even though it may be hard to juggle a full load of classes and a job, working is a great way to raise money for study abroad. Although working on–campus doesn't usually get you the highest salary possible, campus jobs do help your cash flow. Since your goal is to earn fast cash, you don't necessarily need to look for a job oriented around your future career. While career–oriented jobs can be terrific learning and networking opportunities, non–career jobs may have more flexible hours allowing you to work between classes. Also, try making appeals to your local community, religious and academic organizations. These groups may set aside funding, or take up special collections, for students. If you or your family happen to belong to any community or religious organizations, those groups may be more apt to sponsor you because they know you; these groups often see you as a representative or role model and may even ask you to speak at their meetings when you return from studying abroad. If your study abroad in the country of your choice involves volunteer work or charitable activities, some organizations may also be more willing to support your efforts. Some students create an entire, detailed budget and financial plan for their time in the country of your choice only to discover that exchange rates fluctuate and economies can be unstable. When exchange rates were good, you could afford to study in the country of your choice; now that exchange rates are not as good, you may not be able to afford it. The value of the the currency of the country of your choice against the U.S. Dollar goes up or down significantly and can greatly affect a student's personal budget/financial plan. A solid budget/financial plan worked out months before leaving for the country of your choice just may not work at the time of departure. From the time you first created your budget/financial plan for the country of your choice, exchange rates changed and now your planning has been thrown off. To avoid this, consider making your personal budget/financial plan flexible. Include a high and low total spending amount to account for any possible fluctuations in currency value. Also, frequently check exchange rates to keep a better eye on the a citizen of the country of your choice and U.S. economies and better predict any drastic fluctuations. For some students studying in the country of your choice, having enough money is not a worry; they do not need to alter their lifestyle to fit a budget. For others, studying in the country of your choice a may involve more financial planning and changes in lifestyle. If you don't already budget your money at home in the United States, you might want to start doing so when you go to the country of your choice. Budgeting your money doesn't have to be boring or difficult. You can think of easy ways to help yourself remember how much you are spending. Often, foreign currency can seem like "fake" money. It can be difficult to know how much you're spending. This is especially true if you get in the habit of using your credit card for most purchases. A helpful way to convert foreign currency into U.S. dollars is to carry a small pocket calculator with you. You could also learn a few monetary equivalents and tell yourself: "For every the currency of the country of your choice I spend, I'm really spending so many dollars." Below is a sample budget ledger you can print out, fill in, and take with you to help you better keep track of your spending in the country of your choice.